This summer, TTSS established the George Melendez Wright Trumpeter Swan Conservation Award to recognize individuals who have made outstanding lifetime contributions to Trumpeter Swan conservation. Our intent is to occasionally honor those pillars of swan conservation whose accomplishments, often over decades, helped to significantly improve the status and welfare of Trumpeter Swans. 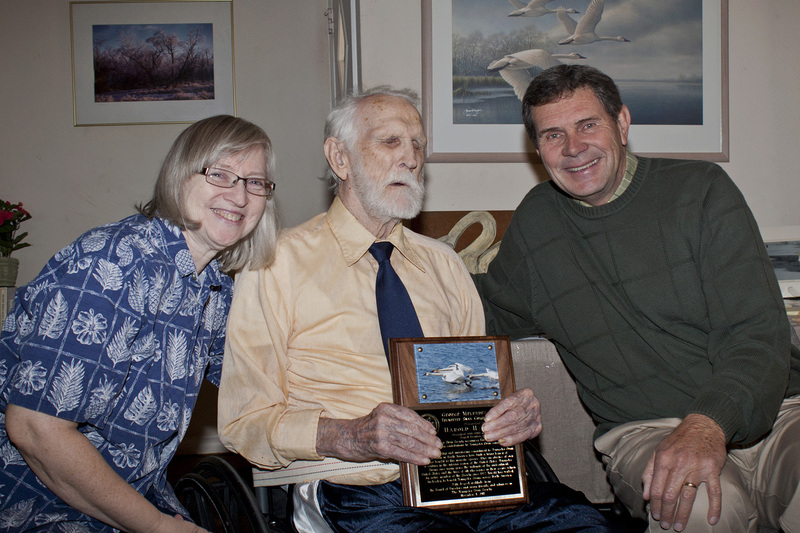 This fall, we are very proud to present the first George Melendez Wright Trumpeter Swan Conservation Awards to Jim King, Harry Lumsden, and Harold Burgess. 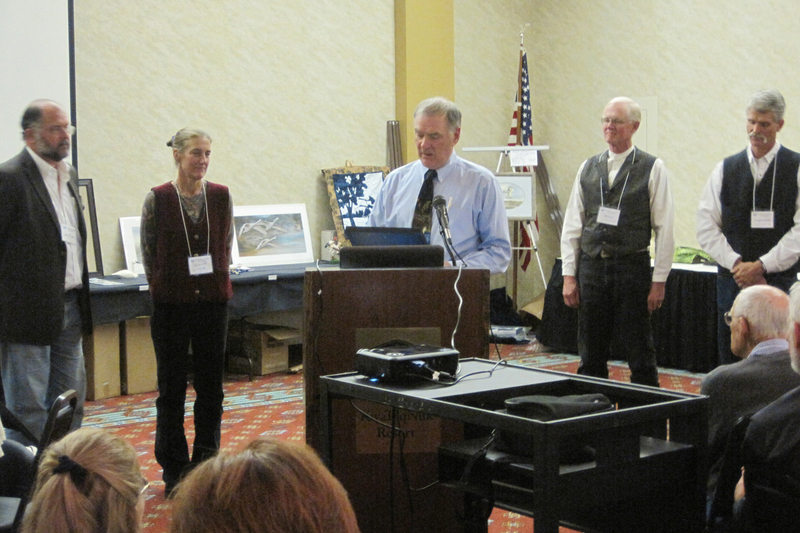 The photo depicts the award presentation at The Trumpeter Swan 22nd Conference, held in October, 2011 at Polson, Montana. 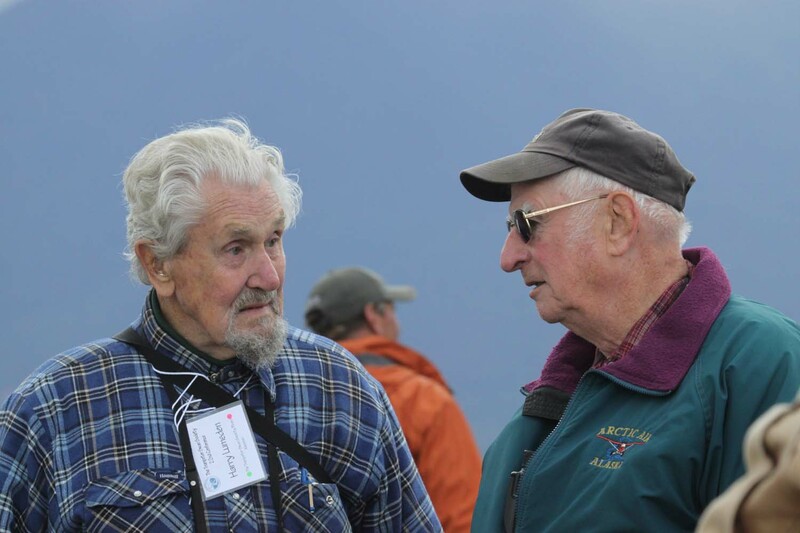 Pioneer Alaskan Biologist-Pilot and Trumpeter Swan expert. Designed and flew the initial Alaska Trumpeter survey in 1968. TTSS Director, 1989-2011 and President, 1989-93 (photo, right). Architect of the Ontario Trumpeter Swan restoration program and longtime advocate for Trumpeter restoration in theMississippi and Atlantic Flyways. TTSS Director, 1982-2011 (photo, left). Longtime advocate and supporter of mid-continent Trumpeter restoration throughout the species’ historic range from nesting in Elk Island National Park, Alberta, to wintering on the Gulf Coast in Texas and Tamaulipas. TTSS Director, 1976-89 and two-term President, 1981-82 and 1984-86. 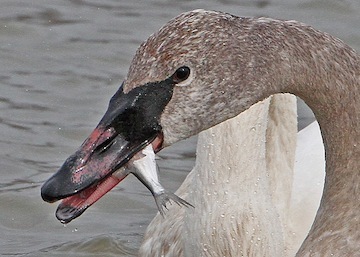 Larry’s image of this hatching year Trumpeter Swan with a fish in its bill gives us an opportunity to talk about close-up photography or cropping a photograph to create a close-up appearance. It also kicks off the theme of our 2012 Photo-of-the-Month selections – The Natural History Moment! This is a wonderfully crisp shot! There is plenty of detail in the feathers, the bill and the eye is tack sharp. To create a photograph with these attributes, you have three primary options as a photographer: You can be physically close; you can be further away with a longer lens or you can closely crop (like drawing a box around the area you want to feature in your photograph and removing the extraneous material) the photograph after shooting with any size lens. I see one, possibly two of the elements I mentioned above in Larry’s photograph: A longer lens and potentially some cropping. One of the benefits of using a longer lens (in this case maybe 100mm – 400mm zoom) is that you usually have a very short depth-of-field (DOF is the area from front to back that is in focus). We can see the DOF (in focus) drops in the water behind the second swan, which indicates a longer lens. The potential cropping is indicated is by the position of the bird in the overall photograph (centered). Cropping is the photographer’s choice and in this photograph Larry has put the subject (the fish in the swan’s bill) he was trying to capture in the appropriate alignment. On January 20, 2011, while at work as a 4-H Assistant Coordinator for the University of Arkansas, I spent the greater part of the day meeting with fourth and fifth grade classes from Heber Springs Elementary School at Magness Lake. The purpose of the outing was to introduce the young students to the one hundred or more Trumpeter Swans that had arrived from places north of us. As always when visiting the swans, I brought my camera and set it up on a tripod just in case of a chance of a good photo presented itself. The students were listening as I told them various facts about our visitors. As I talked with the students I noticed that one of the juvenile swans had something in its beak and seemed to be “chewing” on it. I took a quick look through my camera and saw that the swan had a fish about four inches long, a shad, in its mouth and was trying to swallow it. It was having trouble because the fish seemed to be too large. This went on for about five or six minutes until it had chewed it enough that the fish could be swallowed. The students not only had the opportunity to see the swans but also something that I have never seen or heard of before. They witnessed a swan eating a fish. In watching these swans over the past twelve years I have never observed anything like this before. 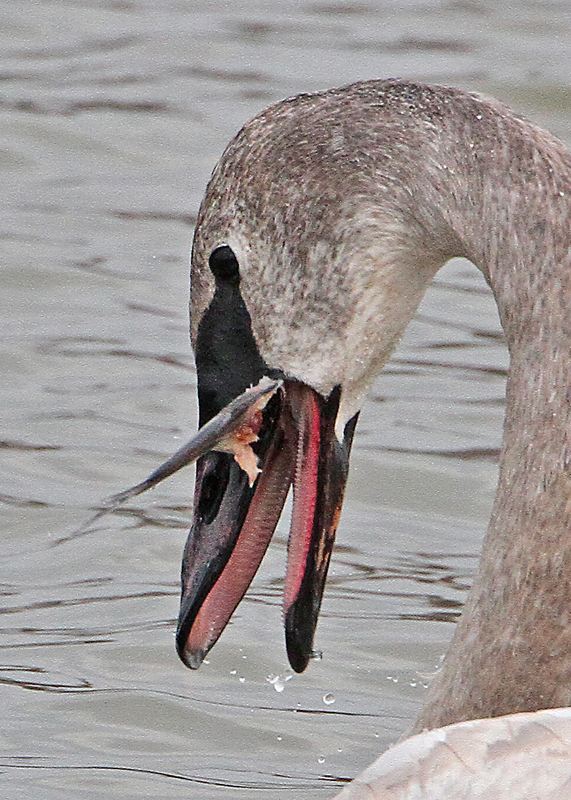 Editor’s note: in the photo below, see how the Trumpeter Swan gets a grip with the lamellae of its bill! We are pleased that Larry was willing to share this “keeper” shot in support of Trumpeter Swans and The Trumpeter Swan Society. 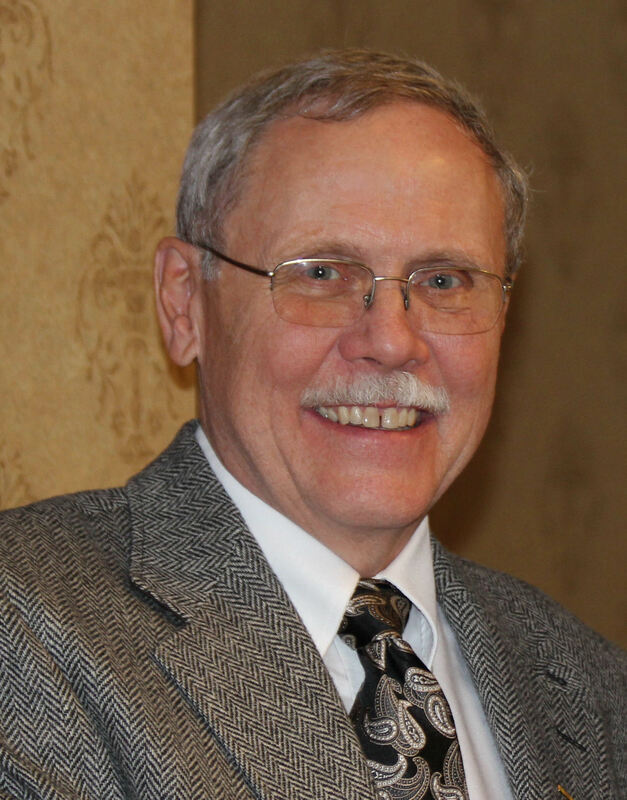 Our newest Director is Dr. Robert Blohm who retired early this year after a distinguished career with the U.S. Fish and Wildlife Service. Bob Blohm has had a longstanding interest in waterfowl and waterfowl ecology after growing up along Saginaw Bay in the State of Michigan. He graduated from Michigan State University with a B.S. Degree in Fisheries and Wildlife in 1968. He then began his graduate work at the University of Wisconsin, Department of Wildlife Ecology, where he received his M.S. Degree in 1977 and Ph.D. Degree in 1979, studying the breeding ecology of the Gadwall in southern Manitoba under Dr. Robert A. McCabe. His field work was conducted through the auspices of the Delta Waterfowl Research Station. His graduate studies were interrupted by military service, where he served as an artillery officer in Alaska and Vietnam. Following graduate work, he was hired by the U.S. Fish and Wildlife Service as a staff biologist in the Office of Migratory Bird Management, in Laurel, Maryland. Bob remained in the Office (now Division) of Migratory Bird Management for his entire career, where he became Chief of the Division in 2007. He retired on December 31, 2010, after working nearly 32 years in the field of migratory bird management. Bob and his wife, Shari, have two sons, Andy and Matt, now grown. The entire Blohm family continues to enjoy a wide variety of outdoor pursuits. You are currently browsing the Trumpeter Swan Society Blog blog archives for January, 2012.